Every day it seems like my to-do list gets bigger and bigger and I often wonder just how important many of those things are. Yesterday I was feeling grumpy and overwhelmed and planned to take a ride out in the country and spend some alone time just taking some photos. Guess what 5 minutes into my drive it started to rain. 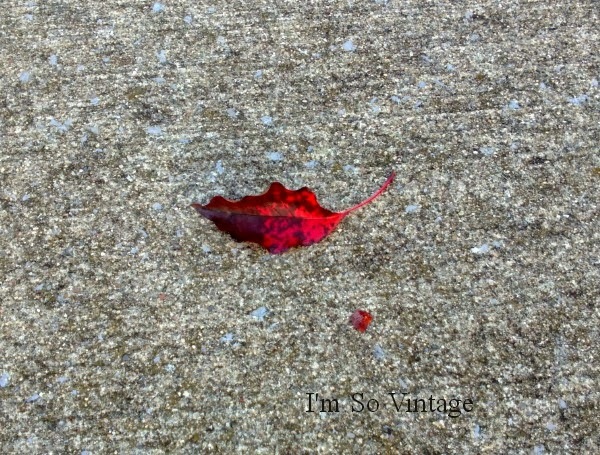 Instead of feeling like that lonely little leaf. I started to laugh. Maybe what I really needed to do was relax and make a new to-do list. So here it is. What is on your to-do list for today. Hi Laura! I can definitely relate! I love how you began to laugh, too, because as we all know, "Laughter is the best medicine!" Right?! I recently decided to stop making To Do lists, because like you said, the chores never got completed and I just felt worse. I did read a suggestion by "an expert" not too long ago. He said to just put ONE thing on your To Do list. Then, after you get that completed, you'll feel proud of yourself! I like that idea! Have a lovely, vintage day! 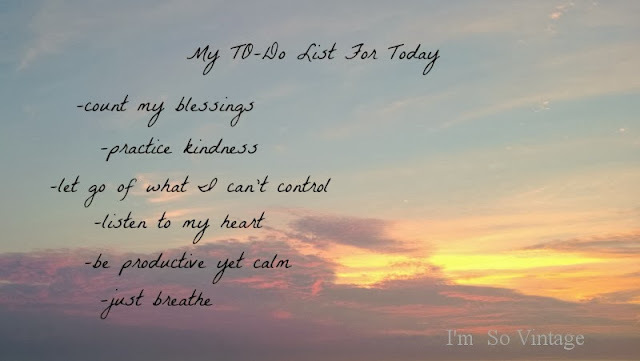 not sure whats on my list but yours is a wonderful list! Good reminders! 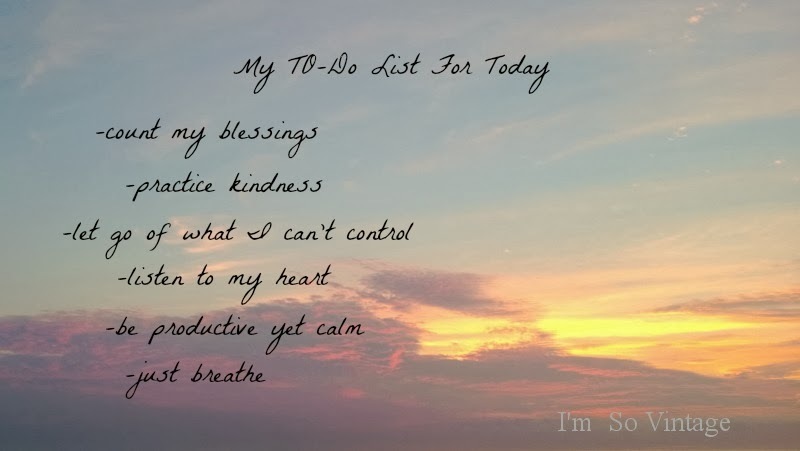 I get very overwhelmed by my list sometimes and then remember that I don't actually HAVE to do most of what's on it--I'm retired so many of my to-dos are my choice! Your to do list is exactly what I need! Your list seems pretty good to me. Boy, can I so relate to this. My to-do list is never-ending and always growing, constantly feeling like I'm behind at even given time. I like your renewed to -do list, seems like a good one. I seem to be having so much trouble getting anything done right now. I do a list, but then things change! Still I like your attitude so I'll keep on trying to stay positive and keep on keeping on! What a great to do list! I need to add it to mine. I like your TO DO list very much! I will have to use that one from time to time so I can stay sane some days. Don’t even ask, Laura. You really don’t want to know. 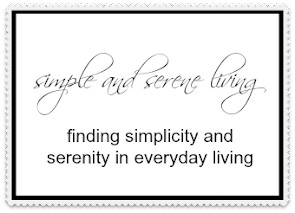 If you would please post your to do list on Pinterest I would love to pin it. Another wonderful post. Thanks for the inspiration, Laura. Everyday my to-do list is crazy long and evry evening I panic because I didn't check half of it and then it's time when all the cats come back home and ask for food and cuddles and I forget my list!! !